Here's the bottom line:Here's a quick summary of each Roomba model so you can make a quick, but informed decision. The Verdict: Roomba 960 or 980? If you're in the market for a top of the line robot vacuum in 2019, you've probably strongly considering the Roomba 900 series. 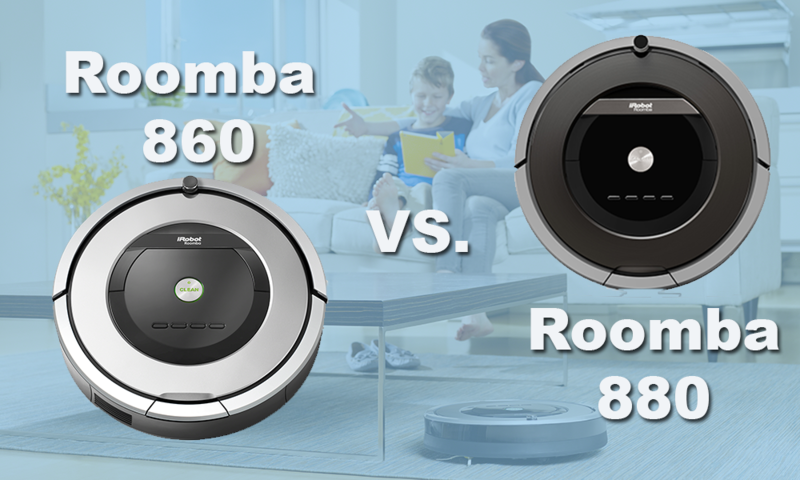 The Roomba 960 vs. 980 are a common pair of robot vacuums to compare. Both of these robot vacuums are top of the line and come with all the things you expect a high-end robot vacuum to include such as superior suction, wifi connectivity, and intelligent navigation. You're probably pretty curious about how these models differ. Well, we are here to tell you they differ in more areas than just price. This guide is designed to help break apart these two Roomba models so you can make an educated decision as to which one is better for you. For those of you who love the details, this is a pretty long article full of just about everything you ever wanted to know about the Roomba 960 and 980 (and a few things you didn't). For those of you that aren't as patient, let's cut to the chase. It comes with a suite of impressive features and will do an excellent job cleaning your home. The Roomba 980 (Check Current Price Here) has a few preferred aspects as well as a few additional features, but to some, not enough to justify the $200 price difference. Now, let's pit the iRobot Roomba 960 vs. 980 and see more of the details. Here's a quick summary of each Roomba model so you can make a quick, but informed decision on which Roomba model is the best for your home. The Roomba 980 is the top of the line Roomba model with all the bells and whistles. It comes with more features and has more power. It is only superior to the Roomba 960 if you have a large home. It has an extended battery and comes with twice as many virtual walls. This is the best option for large families with large home and carpeting. If you're willing to spend the extra money, you will get a better overall vacuum cleaner. The Roomba 960 Is an excellent, less expensive alternative to the premium 900 series models. It has slightly less suction power but can still handle most messes. It comes with a single virtual wall. This is the best option if you live in a modestly sized home and don't need the extended battery life. If you want a top-tier Roomba robot vacuum, the 960 is an excellent choice in almost all scenarios and will work great for home with multiple pets. Affordable: It is a more cost-effective model that does just about everything the Roomba 980 can do, but on a slightly smaller scale. Unless you have a huge house, the 960 will do just fine. Comparable Cleaning Power: Despite what the box might say, the Roomba 960 has as much cleaning power as the 980 for most everyday messes. The Roomba 900 series may have more suction power, but after a certain point, more power doesn't make that big of a difference. Wifi-Enabled: For $200 cheaper than the 980, to still get the wifi connectivity in the Roomba 960 is a huge plus. Easy Maintenance: The 960 is still a fantastic piece of machinery. To only have to devote a few minutes per month to maintenance is terrific. Best of the Best: If you're the type of person that has to have the best of everything, the Roomba 980 is it. It is arguably also one of the most expensive. You get all the bells and whistles and won't have that dreaded fear of missing out if you opt for this more expensive model. Better Battery: With a battery life of up to 120 minutes, the Roomba 980 is far superior in this aspect. This is great if you have a large house that can take that long for the Roomba to clean. Otherwise, your device may have to go back to charge to complete a single cleaning cycle. 2x Virtual Walls: Also an advantage for larger home, the additional wall is an excellent plus so you can mark of multiple areas where your Roomba isn't allowed to go. Carpet Boost: If you have carpeting in your home, having the ability to increase the power when cleaning this area is excellent. You'll know that your Roomba is not only cleaning up surface dirt but is also giving your carpet a deep down clean. The following section will first break down the differences between the Roomba 980 and the Roomba 960. Then, we will show you how they compare in a variety of categories. Let's get into it! Carpet Boost: The Roomba 980 comes with a carpet boost mode while the 960 does not. This means that you can kick your Roomba into overdrive when it has to clean in carpets. It will increase suction power to help dig up the dirt hiding deep down. You also have an "eco" option which uses less power, is quieter but ultimately has less cleaning power than carpet boost mode. Battery Life: Although battery life is dependent on the cleaning mode your Roomba is in, generally speaking, the Roomba 980 has a 60% longer battery life. On average, the Roomba 960 will last 75 minutes, whereas the Roomba 980 will last up to 120. Virtual Walls: While both the Roomba 960 and Roomba 980 come with the option to set up virtual walls, the 980 comes with 2, and the 960 comes with 1. A virtual wall can be set up to dictate an invisible barrier that your robot cannot cross. This can be anything from your kid's rooms to an area it may tend to get stuck on. Power: One of the most significant differences between the Roomba 960 and the Roomba 980 is the power of the motor. The 980 comes with the most recent motor, and the 960 comes with the motor used on the older 800 series models. The new motor claims to have about twice as much suction power, but we found that the Roomba 960 still did a great job. Cost: Depending on where you look, prices with vary. However, it is pretty consistent that the difference in price between the Roomba 960 and 980 is around $200. Whether or not the differences between the two models is worth the price increase is ultimately up to you. According to Roomba, the 980 has 10x AeroForce system cleaning power to the 960's 5x. Now, this might make you assume that the 980 has twice as much suction power, and this very well may be the case. However, in the real world tests, the difference between the two is hard to quantify. For most applications, the 960's power is already much more than you get with other lower priced robot vacuums and is more than enough to clean up most messes. Both vacuums clean up debris thoroughly, so the increased suction power of the Roomba 980 likely only comes in handy for cleaning up unrealistically dense messes. The Bottom Line: The Roomba 980 may have more power, but the Roomba 960 has more than enough suction to clean everything on the first pass anyway. Both the Roomba models come with wifi capabilities and can connect to the IRobot Home App. The app can control your Roomba, set preferences, cleaning schedules and even see the map it has made of your home. If you like, you can request that your Roomba pay more attention to certain rooms that may have more foot traffic and collect more dirt. One thing to note, the app is NOT REQUIRED to use your Roomba. It just allows you to have an intuitive interface to make operating your Roomba easier. You can use your Roomba without a wifi connection at all, but you will be missing out on some of the best features that make a Roomba what it is. These features include scheduling, floor mapping, and carpet boost mode. In short, your Roomba can operate in "automatic" mode if for whatever reason you're considering a Roomba and don't have wifi in your home. The Bottom Line: Both Roomba models can be connected to the same app, so the experience is the same between the two. The Roomba 900 series has upgraded navigation abilities over previous models. Both models have two distinct additions making them superior to previous models. The first is a camera. This lets your Roomba actually see where it is an helps prevent it from running into furniture. Previous models relied on dodgy sensors that worked sometimes and not others. More often than not, older Roomba models would run into something before it realized it was there. Only then would it decide to go a different direction. The second added feature is the ability to know where your Roomba has already been. This means that both the Roomba 980 and 960 can navigate your home without doubling over on areas that it has already cleaned. The Bottom Line: Both Roomba models come with the same upgraded navigation features which make them superior to lower-grade and older Roomba models. At first, a robot vacuum sounds great, but more often than not, they require just as much maintenance as a traditional vacuum. The Roomba 800 and 900 series vacuums set themselves apart from the competition due to their low maintenance design. Both the Roomba 980 and the Roomba 960 have brushless extractors, which means that they can kick up dirt and debris without having to worry about hair getting tangled. This is arguably the single best design feature of the upper level Roomba models. It saves you a ton of time and headache. Empty the dustbin when prompted to do so. The app will let you know when the bin is full. Alternatively, you can also clean it after every use if you're feeling extra spry. This takes about 30 seconds. Every so often you should shake off your HEPA filter to remove any fine dust, debris or pet hair. This only has to be done periodically and also takes less than 30 seconds. Once a week you should check to see if any sneaky debris has managed to get itself stuck in the rubber rollers. While they will do a much better job than traditional brushes, they aren't perfect and you'll still find things stuck in there from time to time. This will take you a maximum of 5 minutes. So over the course of a month, you'll spend under 20 minutes performing maintenance on your Roomba, which in the grand scheme of things isn't half bad. The Bottom Line: Both Roomba models use the brushless extractors, which take the most time to clean but it's still not much. You'll spend a maximum of 20 minutes per month tending to your Roomba 980 or 960. The battery life is one of the key differences between the Roomba 980 and the Roomba 960. The Roomba 960 uses a 2130 mAh Lithium-Ion battery and is expected to last up to 75 minutes of continuous use. Similarly, the Roomba also has a lithium-ion battery, but it is 3000 mAh and is expected to clean up to 120 minutes. For most houses, you can get plenty cleaned up within 75 minutes. However, if you have a large 4+ bedroom house, you may benefit from the extended battery life of the Roomba 980. Both models are designed to return to their docking stations to recharge and continue cleaning when they left off, but if you have a larger home, the 980 may be a more efficient option. Bottom Line: The Roomba 980 has a better battery and will last up to 120 minutes. The Roomba 960 will last up to 75. All current Roomba models are designed to be able to clean the edges of your home effectively. They have side brushes that allow them to reach into a corner. Both the Roomba 960 and 980 have an edge cleaning mode so you can explicitly tell the unit to focus solely on these areas. We suggest you target the edges of your home at least once a month. Dirt tends to accumulate in these areas and they are often neglected. Both Roomba units will be able to tackle this job without an issue. Both the Roomba 960 and 980 can handle navigating and effectively cleaning multiple rooms. Theoretically, there is no limit to how much space they can clean per level. Both models are able to create a virtual map of your home and clean until it has gotten everywhere. If your home is large enough that it takes longer than the battery life to clean, your Roomba will simply send itself off to change then pick up where it left off until everything has been cleaned. According to Roomba, you can expect your unit to clean up to 2,000 square feet per level, but this is a crapshoot. Nothing is stopping your Roomba from going to charge and cleaning upwards of 3,000 to 4,000 square feet per level. This functionality is specific to the higher end Roomba models and is one of the things you're paying for when you choose the Roomba 900 series over a lower end line such as the 600​. The Bottom Line: Both Roomba models can clean multiple rooms without a problem. When it comes to cords, you don't want your Roomba eating up your expensive stock iPhone or Samsung charging cables. All Roomba models are designed with anti-tangle technology that stops them from accidentally chewing up loose wires or carpet fringe. This doesn't mean that you shouldn't try to keep cables away from your Roomba, it just means if it accidentally stumbles upon some, it won't destroy them. One of the other fundamental differences between the Roomba 980 and the Roomba 960 is the number of virtual walls that come with the unit. The Roomba 980 comes with two virtual walls, whereas the Roomba 960 only comes with one. It is apparent that due to the extended battery life and additional virtual walls, the Roomba 980 is meant for larger households. With your virtual walls, you can set boundaries for your Roomba. You can either set them up to be in "virtual wall mode" which will prevent access to an area up to 10 feet wide, or they can be set to "halo mode". Halo mode allows you to block off an area of up to 26" around an object. Bottom Line: The 980 comes with two virtual walls, and the 960 only comes with one. All other accessories are the same. A big thing that I find a lot of people worry about when they are considering a robot vacuum is that the unit will send itself flying down your stairs. This isn't the case. Even the least expensive models have some type of cliff detection features to help protect the unit from falls. The Roomba 980 and 960 are both equipped with this features so you can rest assured your Roomba won't accidentally take a deadly tumble. The Bottom Line: This is a standard feature in almost all robot vacuums, the Roomba 960 and 980 included. If you have hardwood floors in your home, this won't be a big deal breaker for you. It just makes sense that your vacuum will have to work harder on carpet than on hard surfaces. The dirt is deeper down and harder to extract. With the Roomba 980 you get a feature called "Carpet Boost". This allows your Roomba to kick it into high gear on carpet to get a deeper clean. It also uses more power, so make sure you aren't running your until in carpet boost mode continually. Note, this feature is only available on the 980 model. It can actually sense when it is going over carpeting and will automatically turn on carpet boost mode to ensure you're getting a deep down clean. The Bottom Line: Only the Roomba 980 has carpet boost mode, but if you don't have carpet, this won't matter. Hardwood Floors are sensitive to scratches but are otherwise reasonably easy to clean. Both the Roomba 980 and 960 will do a great job cleaning up your hardwood floors and won't cause them any damage. Since they do not use traditional brushes, they won't scratch the surfaces of your floors when they clean. The Bottom Line: Both are effective yet gentle enough to be used on hardwood flooring. When it comes to value, the Roomba 960 is the winner. You get most of the features that come with the 980, but you save yourself $200. However, if you have a large home (over 4000 square feet), you may want to consider the Roomba 980 for the increased battery life and additional virtual wall. It will make cleaning more efficient and effective. In most cases though, the Roomba 960 will do a great job and make sure your whole house is clean so you don't have to worry about it. If neither of these robot vacuums are doing it for you, check out our roundup post for the best vacuums of 2018 to see more options. The Roomba 980 has more features, but do you think it's worth the extra money?